Taking care of your residential deck is something you’ve perhaps neglected for a few years, despite using your deck for far longer. If you haven’t invested in any maintenance since that time, you’re probably going to encounter some problems. You may need to apply residential waterproof deck coatings to repair or prevent any wood rot and other deterioration problems. Waterproofing your home’s deck is an essential way to prevent water from causing major structural issues. At the center of this solution is using waterproof deck coatings providing a shield to the damage water can do over time. However, you’re probably wondering what the characteristics are of waterproofing systems and which ones to look out for when having the procedure done. It’s important to know because you may need a tougher coating on your deck depending on the climate you live in and other circumstances. Here’s some characteristics to look out for so you make a more educated decision. If you use plywood on your deck, the type of coating you’ll need should contain materials staying durable over the long-term. Plus, you’ll want something not requiring extensive maintenance throughout the year. It’s a good idea to use a waterproofing system on plywood if your deck gets plenty of foot traffic, or if you’ve used plywood on stairs, walkways, and roof decks. Applying a galvanized metal lath sets a durable foundation for these type of coatings. Next, this waterproofing method should apply a polymer cement base coat and an intermediate coat to assure foot traffic won’t wear out the materials quickly. Ask if the waterproofing material is UV resistant as well if you live in overly sunny climates. Perhaps you’ve used concrete as part of a roof deck or on a balcony. Concrete is certainly strong, though you need waterproofing to prevent issues like cracking and capillaries. More technically known as cementitious crystallization active systems, they’re usually applied as internal or external slurries. The best materials in this waterproofing system involve a fiberglass mat, elastomeric resin, as well as polymer cement finish. Adding the latter brings further durability to aid as a walking surface. By adding a pigmented sealer, you can choose a particular color and give added protection. Any waterproofing expert should offer a variety of sealer colors to give some customization to your deck style. If you entertain often on your deck and have loud parties, you may need to find a waterproofing treatment controlling how sound travels. 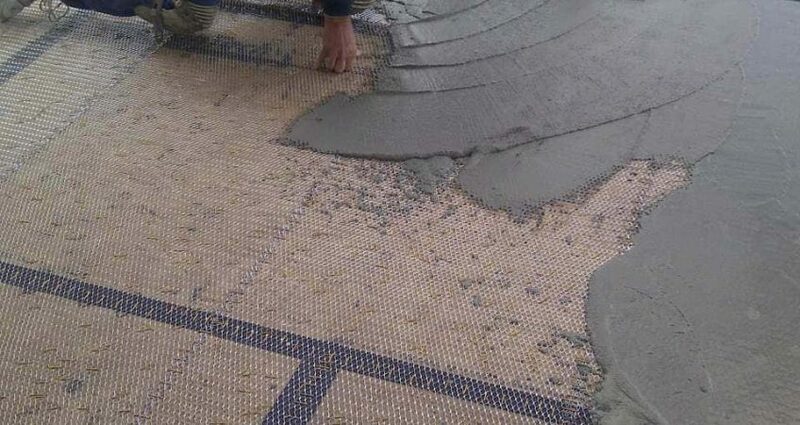 It’s possible to do this using the materials found in concrete waterproofing above, though adding a high-strength underlayment. This should finish off with an acoustic mat for a more thorough solution. You’ll find this protects your deck from the elements, plus does a great job of preventing loud sounds from reflecting so you don’t bother your nearby neighbors. It’s possible your residential deck has plywood, but also has a concrete topping. Having this may require tougher waterproof deck coatings, meaning applying a dual layer to accommodate plywood and concrete. This isn’t impossible to do with a unique dual application system. Regardless, to make it strong, it should have a psi level of 6000. Using this also applies to when you’re first building your deck for early waterproofing protection. By adding modified cement with polymer and a rubber membrane, you get a unique dual protective layer to keep your deck safe from the elements for years to come. At Pli-Dek Systems, all of the above are available through our patented waterproofing coating systems not available anywhere else. Contact us to find out more details about the characteristics in our coatings and why residential decks sometimes require more protection than you think.